The Old, Old Story rolls on. From water flowing from the rock to attack, a battle for survival. 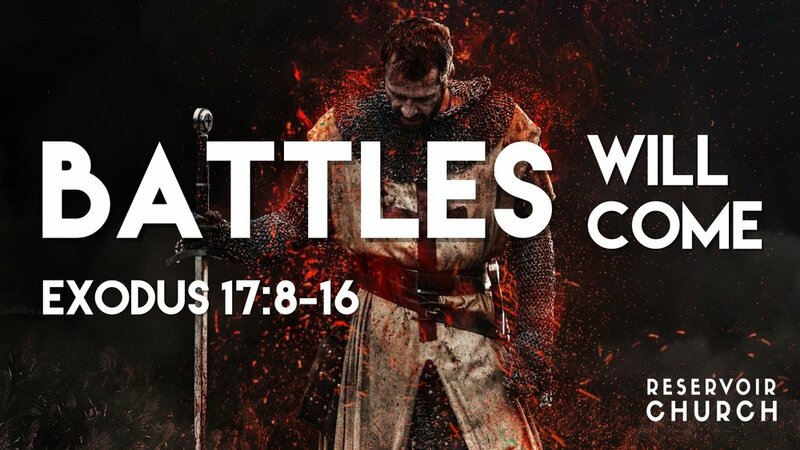 Battles will come. Exodus 17:8-16. Sunday 10 am at Del Norte High. Disability Outreach - This Sunday! Bring the peace and comfort of Jesus to our community as we sing and pray with the residents of Villa Bernardo nursing facility. We will meet at 2pm in the lobby. 15720 Bernardo Center Dr, San Diego, CA 92127. Contact Janice with any questions janchan@gmail.com. Production Teams - We are building our teams to help with unloading/loading of the church van, media (projection), and sound. We will train you, all are welcome to serve. Email jonathan@reservoirchurchsd.org to get trained and scheduled! New Giving Platform - Reservoir's online giving service is switching. If you come to the website to give each time, no worries just click on the giving page. If you have a recurring payment with PayPal you might think about switching to the new system from our site. You can also now Text-to-Give! "Text any amount to 84321 to give" and follow the prompts to set it up. Hold Fast Women’s Retreat - One month away! Ladies, don’t miss the first ever Reservoir Church Women's Retreat! Come reflect with us on Hebrews 10 and share times of fellowship and renewal. We will be in Big Bear Friday afternoon September 15 to Saturday evening September 16. The cost is $75 per person (covers food, lodging, and retreat materials). Contact Stacy sshradar@gmail.com or Janice janchan@gmail.com with questions or register here. Prayer - God has given us the great opportunity and power in the gift of prayer. To petition him for help and to battle for his glory and our good. Will you join the church in increasing our prayer? On Sunday mornings there are people available to pray with you as well as before service at 9 am. You can reach out to other Reservoir people and ask to be praying for one another through the week, in small groups and Bible studies. Together we can benefit from this gift the Lord has given us. Let's do it.